If the applicant is denied, there are certain avenues that allow the applicant to appeal the decision (notice of intent to deny, motion to reopen, etc). The main drawback to consular processing is that there is a very long processing time for immigrant visa applications. The processing time for immigrant visas can vary depending on the applicant’s country of residence and the volume of applications being processed by the National Visa Center (NVC) and the U.S. Consulate where the applicant will have their interview. Typically, immigrant visa applications can take anywhere from 8-12 months to be adjudicated. The steps to obtain an immigrant visa through consular processing are also lengthy and complex. It is not recommended for applicants to file on their own. Once the US Consulate receives the case, they will schedule the applicant for an immigrant visa interview. All immigrant visa applications are processed by the National Visa Center, which is inundated with thousands of applications that must be reviewed. The National Visa Center (NVC) is a government agency that is responsible for the pre-processing of all immigrant visa petitions approved by the United States Citizenship and Immigration Services (USCIS) including family sponsored and employment based immigrant petitions of foreign nationals residing overseas. The National Visa Center serves as an intermediary between USCIS, where the immigrant visa petition was first approved, and the U.S. Consulate, where the foreign national will eventually undergo their immigrant visa interview. Once the I-130 Petition for Alien relative has been approved by USCIS, the application is then forwarded to the National Visa Center located in Portsmouth, New Hampshire where it will be pre-processed and retained until the immigrant visa application is ready to be adjudicated at the foreign national’s closest U.S. Consulate. It takes approximately 30-60 days for an immigrant visa application to be transferred from USCIS to the National Visa Center. The National Visa Center recommends that an applicant wait at least 60 days from the date of the immigrant petition’s approval before calling to confirm the receipt of an application. The immigrant visa process is a long and tedious one, due to the large volume of immigrant visa applications processed at the National Visa Center and long waiting times to receive an interview at the applicant’s designated consular office. If the applicant is denied, there are few options to appeal the decision. In most cases the applicant must seek an alternative or re-apply. The petitioner is not required to be present at the time of the immigrant visa interview. 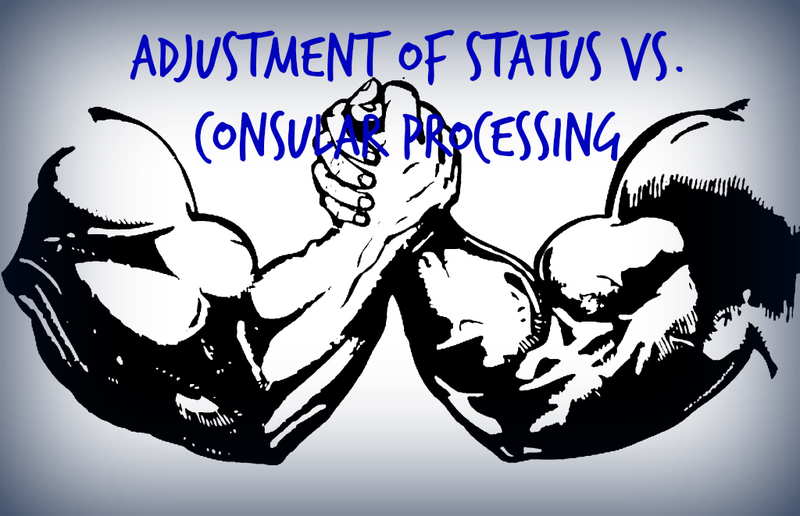 Please click here to read more about adjustment of status and consular processing. To discuss what option is right for you please contact us for a free first consultation.